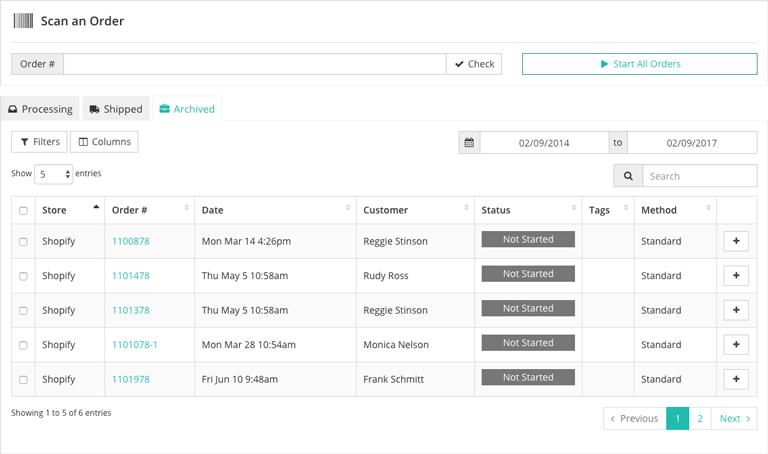 The Archived tab allows you to view and manage archived orders within a given time range. Archived orders are those that have not been shipped through SKULabs but are no longer available for processing. Your archived orders are laid out in a table. You can expand an order to view more information about it, such as its contents and the shipping address, by toggling the Expand button. Packaging: If the order's packaging information is available, whether from item details or previously memorized configurations, those packaging dimensions will be shown here. Weight: If the order's package weight is available, whether from item details or previously memorized configurations, those package weights will be shown here.